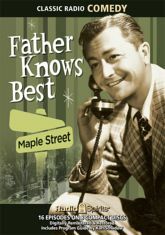 Father knows best -- or does he? Reliable family man Jim Anderson deals with the everyday problems of postwar life in the radio precursor to the famous 1950's TV series. Robert Young stars in these sixteen heartwarming comedy classics - including several previously uncirculated broadcasts. Visit the white frame house on Maple Street, and listen in as Father struggles to keep his cool and set a good example, in spite of an onslaught of surprises, secrets, and shenanigans!